One of the aims of the Flour Advisory Bureau is to dispel any misconceptions about bread. Many of these are commonly reported in the media. So below, we have highlighted some of the most commonly reported inaccuracies and misconceptions to give you the facts. Mass produced bread is nutritionally different to home baked or artisan bread. All bread recipes use the same basic ingredients which are flour, water, yeast and some salt. Nutritionally, there is not much different between a sliced and wrapped loaf, and an unwrapped loaf. Very little of the wheat we use to make bread in the UK is British. Nearly all the flour used in the United Kingdom is milled here. The proportion of British wheat used by millers has grown steadily over the last forty years from around 30% in the early 1970s to the current level of about 85%. Indeed many loaves are made entirely from British wheat. Each year we mill into flour more than 5 million tonnes of wheat grown by UK farmers, which is used to bake bread in large bakeries, artisan bakeries and supermarkets, as well as biscuits, cakes, pastries and other delights. Wholemeal bread is better for you than white. Of course, wholemeal bread is good, but that doesn’t make white bread bad! The dietary contribution of white bread is often under-appreciated. The Governement’s National Diet and Nutrition Survey (NDNS) shows that white bread contributes 10% or more of adult calcium, iron, manganese and thiamine intake; it is low in fat and sugar but provides one tenth of our dietary fibre and nearly a tenth of protein. 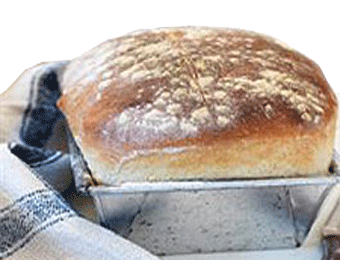 For information about the nutritional content of bread, see our nutrition pages. Bread is fattening so steer clear when you are on a diet. With a slice of wholemeal bread containing only 76 calories and 0.9 grams of fat, and a slice of white bread providing only 77 calories and 0.6g of fat, eating bread will not make you fat. It is what you put on the bread that increases the calorie and fat content of sandwiches and toast. Any diet which limits the intake of certain food groups can lead to potentially dangerous deficiencies in a number of different vitamins and minerals. With most medical professionals now recommending a healthy, balanced diet in the majority of cases, it would be more sensible to take a similar approach rather than following the latest diet. Wheat allergy and intolerance is becoming more common. Only 2% of us have a food allergy. Wholemeal bread should be eaten by children and young adults instead of white bread as it contains more calcium. According to data published by the Food Standards Agency in 2002, a medium slice of wholemeal bread provides around 37mg of calcium. A medium slice of white bread on the other hand would provide around 40% more calcium – around 62mg per slice. Perhaps with this in mind, parents may find it easier to let their child choose which type of bread they would prefer to eat – white, brown or wholemeal, they can all contribute significantly to their daily calcium intake when included in the daily diet. White bread is full of sugar. In fact bread (white, brown or wholemeal) doesn’t normally contain sugar as part of the recipe. A small portion of the starch present in flour is broken down into maltose and fructose, which are types of sugar, as bread ferments in the bakery. This means that even though none has been added, bread contains a small amount – between 3 and 4% (or 1-2 grammes per slice) of sugars when it has been baked.